Mary Mc Cann. Church View, Delvin. Harry Barry. Dublin Formerly Delvin. Jean Flynn. England. formerly, Delvin. 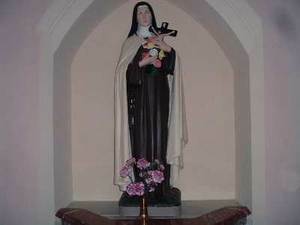 Sr. Concepta Murtagh. Loreto Convent, Navan. Ruth Lynch Barry. Dublin. formerly Delvin. Frank Walsh. Dublin. formerly Delvin. Martin Davis. Australia, formerly Robinstown, Delvin. The Christian who unites his own death to that of Jesus views it as a step towards him and an entrance into everlasting life. When the Church for the last time speaks Christ’ s words of pardon and absolution over the dying Christian, seals him for the last time with a strengthening anointing and gives him Christ in viaticum as nourishment for the journey, she speaks with gentle assurance: Go forth, Christian soul, from this world in the name of God the Almighty Father, who created you, in the name of Jesus Christ, the Son of the living God, who suffered for you, in the name of the Holy Spirit, who has poured out upon you. Go forth, faithful Christian! Ursula King. Dardistown, Hse, Bracklyn. Susan Maguire. Stoneyford Park, Delvin. Gerry Kiersey. Stoneyford Park, Delvin. Baby Marcus Daugela Dryderstown, Killulagh. Amy Sheridan.Laura Finnucane. Southill Hse. Delvin. Gretta Mc Donnell. Billistown Hse, Delvin. Nancy Lenihan. Bells Hollow, Castletown, Delvin. Martina Yeoman, nee Mc Enerney, formerly Billistown, Delvin. Tommy Mc Cann. Robinstown, Delvin. Bernie Drum. Clonmaskill Hse, Delvin. Bernie Mc Grath. Cartenstown, Delvin. Deborah Confrey. The Courtyard, Delvin. Larry Monaghan, formerly Killulagh, Delvin. Rose Larkin formerly Rosmead, Delvin. Mike Curran. formerly Southill, Delvin. Brendan Mullen. Main St, Delvin. Alan Geoghegan. Lacora Glen, Delvin. Joe O' Reilly. Castletown House, Delvin. Fr. Leo Clarke. Dalgan Park, Navan.